Need to stretch your apps budget? 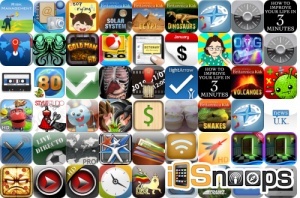 Here are 51 iPhone, iPad and iPod touch apps that just went on sale. This app deal alert includes Eufloria, Call of Cthulhu: The Wasted Land, Around the World in 80 Days: The Game, Pizza Vs. Skeletons, Doors of the Mind, GoldMan, Doors of the Mind, Trainz Simulator, AnyPlayer, OMGuitar, AirDisk Pro, and many others.